yesterday was a fun day. 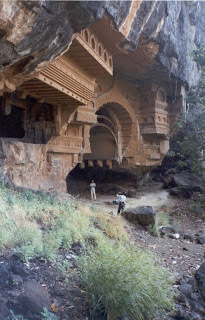 Myself and Hemisha went Rappelling at Kondona Caves - close to Karjat. It was a tiring 2 hour hike (I know.. I am not in shape!!) and then was the best part - learning how to rappel and going down a 150 foot drop to the Kondona Caves. I enjoyed it thoroughly and maybe will do some more of this if time permits in the future.